Mmmm...I love my yogurt! Did you know there's now a Weight Watchers approved yogurt? Yoplait Light and Yoplait Greek 100 now have 20 flavors for only 2 Weight Watchers® PointsPlus®value each. Love it! It's yogurt specific for those on Weight Watchers but for those of us not on Weight Watchers, it's an added bonus because it just seems that much better with the lower 100 calorie count. To make it even sweeter for you, we're doing a weekend flash giveaway! We're not just helping you eat healthy; we're promoting a healthier lifestyle! I was most excited to try the Mixed Berry flavor from the Yoplait Greek 100 line. From the Yoplait Light line, there are just too many flavors that I want so I'm not even going to try. What about you? What flavor are you most excited to try? Buy It: Shop in stores for Yoplait yogurt products. 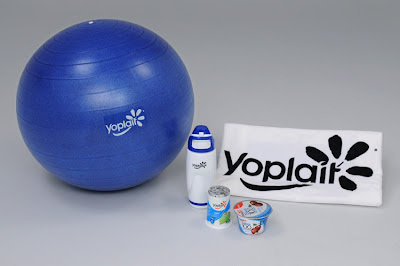 Win It: 1 lucky WOS reader will win the Yoplait gift pack as listed above. Enter on the Giveaway Tools form below from Oct 4, 2012 10PM EST to Oct 7, 2012 11:59PM EST. Open to US, 18+. Good luck! Please take the time to enter my other giveaways while you're here. I would eat it for breakfast. I want to try Yoplait Greek Key Lime and Coconut. Yoplait light cherry with granola - Thanks!